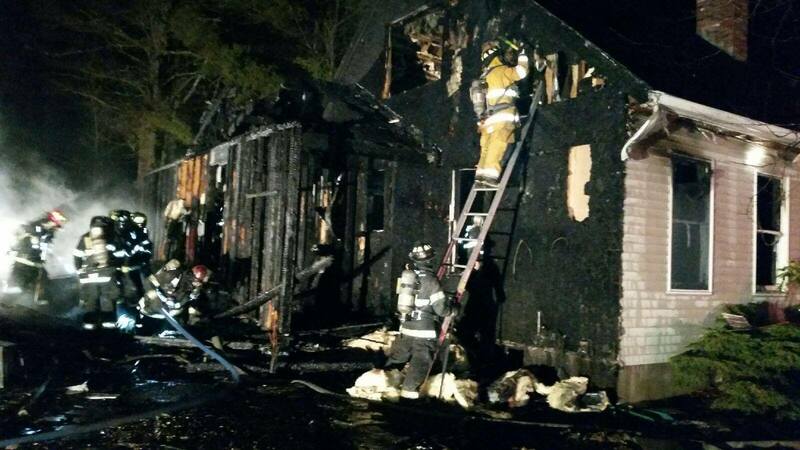 New Gloucester, Maine – On Friday April 1, 2016 at 6pm, the New Gloucester Fire & Rescue was dispatched to 454 Morse Road for a reported garage fire. The emergency call was placed by neighbors and passer-byes. Upon New Gloucester’s arrival, the fire had spread from the two car garage to the Cape style home. Fire Crews had the bulk of the heavey fire knocked down within 30 minutes of arrival. The fire had consumed the garage upon arrival and had entered the home’s first and second floors. Approximately 15,000 gallons of water was used to extinguish the fire along with 25 gallons of fire suppressing foam. The water was trucked in from the Pineland Campus’ fire hydrant system. New Gloucester was assisted by Gray, Windham, Auburn, Poland, Durham, North Yarmouth and Pineland Security. The home, garage and contents are a complete loss with an approximate value of $450,000. “The homeowners were credited with closing the door that separated the garage and home, and evacuating as soon as they knew the garage was on fire,” stated Captain Scott Doyle with New Gloucester Fire & Rescue. “People are encouraged to close doors as they exit a burning building, as long as life safety is not at risk, this can prevent further damages and contain the fire,” added Captain Doyle. No one was injured during the incident. There were no pets in the home. This entry was posted in New Gloucester Fire Rescue, News and tagged community, local government, local organizations, NGFR. Bookmark the permalink.